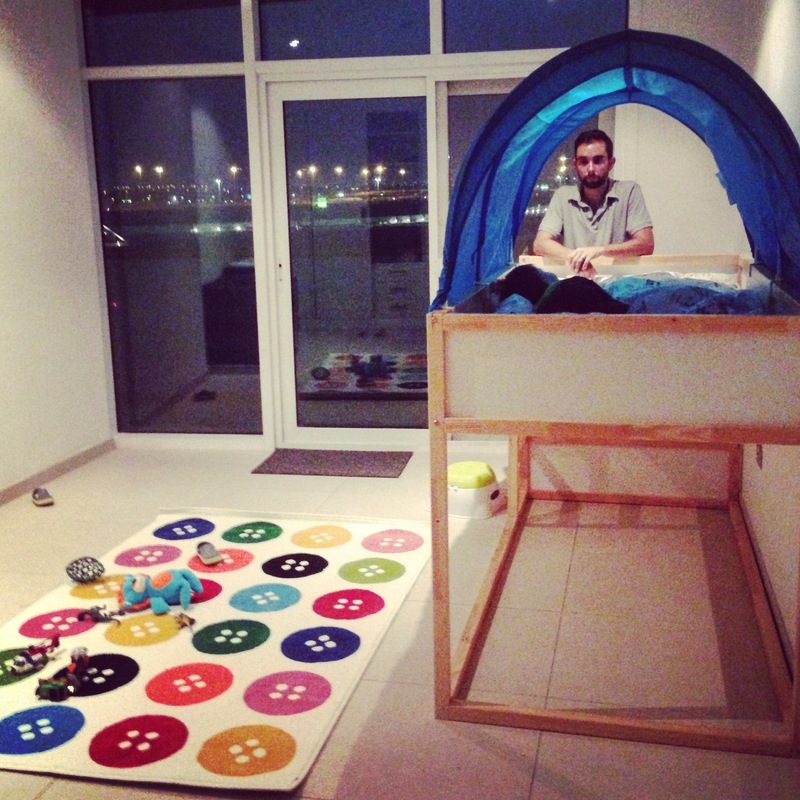 I’m writing this on absolute fumes — all three of us are exhausted, but its important to write so that I can remember what it was like setting up this new life in Abi Dhabi. After all, this blog is first and foremost my journal to record our memories. Thursday afternoon/evening was the start of our weekend; the beginning of moving out of the hotel room that has been home for the past three weeks, and into the apartment where we will live for at least the next year. It was such an incredible relief to find out that we were, in fact, going to get the apartment that we wanted so badly. I thought that securing the apartment was going to be the hardest part of this process — I was wrong. I don’t know how I managed to forget how tiring it is to move — we move ALL THE TIME. No seriously, Tony and I have never lived in any place longer than 3 years and 2 months. So we should be pretty darn used to this whole moving thing. 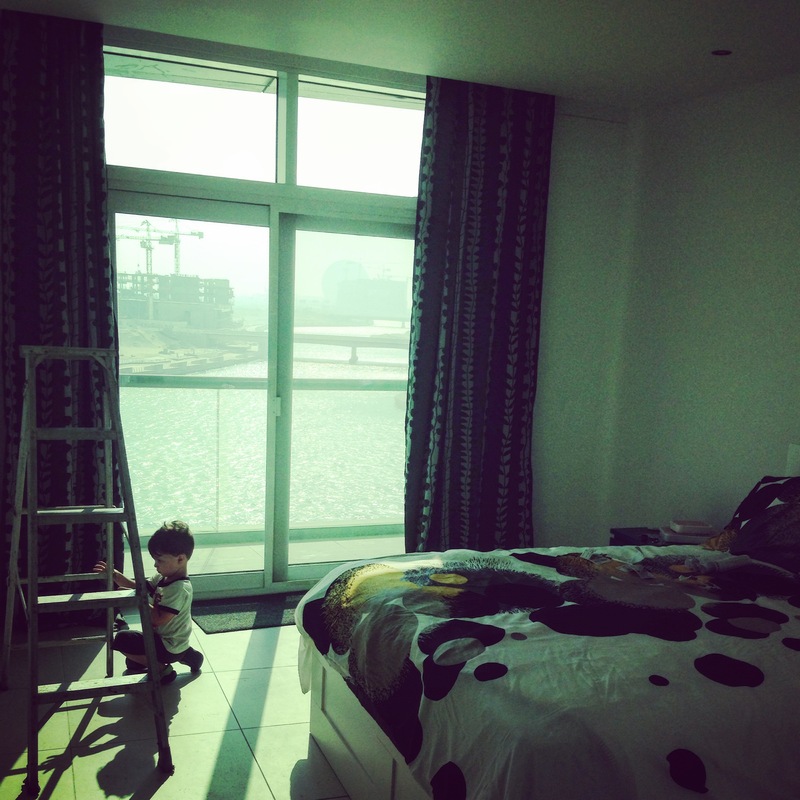 And we are — it’s just that 3 year old Matteo + foreign country + starting from scratch setting up a home = a lot of work. On Thursday, we got the keys to our apartment. and Tony was able to see the place for the first time. I was relieved — he liked it too and told me I’d done a good job. That evening, Tony placed our furniture order at IKEA and set up delivery for Saturday morning. We spent Friday getting the non-furniture items we needed for the apartment. Our rental car is quite small, so we had to be mindful of how much we purchased to make sure it would all fit! We dropped everything off at the apartment. At nap time, I went back to the hotel with Matteo while Tony continued to cross off our purchase list. Saturday we were up early to prepare for moving day. We moved a lot of our clothes over to the apartment and I started unpacking organizing as we waited for the furniture to arrive. IKEA was supposed to deliver at 11:30 — but nothing. By mid afternoon, I had to get Matteo back to the hotel for a nap so Tony stayed at the apartment and waited…and waited…and waited. The furniture finally arrived at 4:00. Because we’d spent so much at IKEA, delivery and assembly was free and Tony said that the delivery guys were flying putting things together. He also said its a good thing they were doing that part — with the amount of stuff we’d bought, it would have taken us a week to get everything together on our own! Once Teo was awake, he and I went back to the apartment to check out the progress. I was amazed — even with all of that furniture, the apartment still felt a bit empty! It must be bigger than I realized. The rooms were swallowing up the furniture we chose. Curtains and artwork will help with that. Good news, I’m happy with all of the choices we made and everything is comfortable and functional! We chose a really cool, lofted bed for Matteo (he calls it a tree house). We also bought a blue tent topper for it. He was immediately excited about the bed — but it became clear quite quickly that he’s not ready to use a ladder. Every 5 minutes he was calling for us to help him get in/out of bed. So today I started to take the bed ALL THE WAY APART and reassembled it without lofting the bed. This way, he can get in and out on his own. Honestly, his room is huge so he doesn’t need a lofted bed to create more play space. His room is bigger than ours — plenty of room for a sleeping area and separate playing area. I also started hanging curtains in each of the three rooms. The big, beautiful windows in the living room and both bedrooms maximize our water view, but they also allow the apartment to heat up in the afternoon sun. I had to buy ceiling mount curtain rod brackets in order to hang the curtains. Thank goodness, IKEA had this in stock. I bought the Kvartal ceiling fitting and curtain track rails and I am very pleased with them — fairly easy to install and perfect for these large windows. I was able to get the curtains up in both bedrooms today (not an easy feat when simultaneously trying to corral Matteo). I misjudged the size of the living room windows (they span the whole wall) and need one more track to fit that wall. I’ll get those curtains up tomorrow. We are frustrated by a few things at the apartment — I don’t want to paint a picture that everything is perfect and there are no problems here because that’s simply not reality (this topic deserves its own post in the future). The biggest thing is that the AC isn’t working properly in our apartment, making it quite hot. The heat made for a grumpy Jen today as I was trying to get as much done as possible so that we can move in ASAP. Of course, we won’t be moving in until the AC is working properly. That would not be healthy for any of us! We have our walkthrough with our agent and the building management company on Tuesday morning so we’ll be adding that to the list of needed fixes. There are several other little things more, but the AC is the biggest issue. 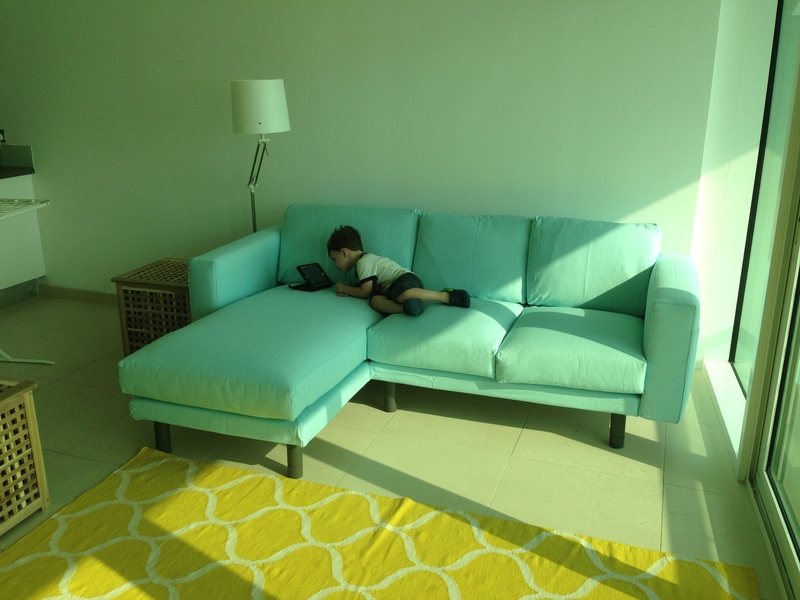 Matteo christening the new couch its first layer of crumbs. Make yourself at home, son. We were well prepared for life here. The things that are frustrating (no one is on time, getting the run around when you need help, etc.) are things we were warned about. It’s just hard when you’re trying to get set up so that you can move and you keep encountering road blocks. We’re grateful for our continued access to the hotel room, with its cold AC and working internet and cable, but we’re excited to get in to our apartment — in to our own space. Its hard having the keys to the apartment and furniture all set up, but not be able to live there yet. I feel like I’m rambling now. Sorry, I’m so tired! My fitbit is telling me I have 15K steps so far for today, but I was shocked that it wasn’t more. Many thanks to my mini partner in crime, Matteo. Furniture shopping and DIY projects might be fun for me, but they are not fun for a 3 year old. He barely complained all day long — even when I yelled at him (and then I cried) after he picked up and threw the IKEA hardware I’d spent 10 minutes organizing. I love you, little buddy. 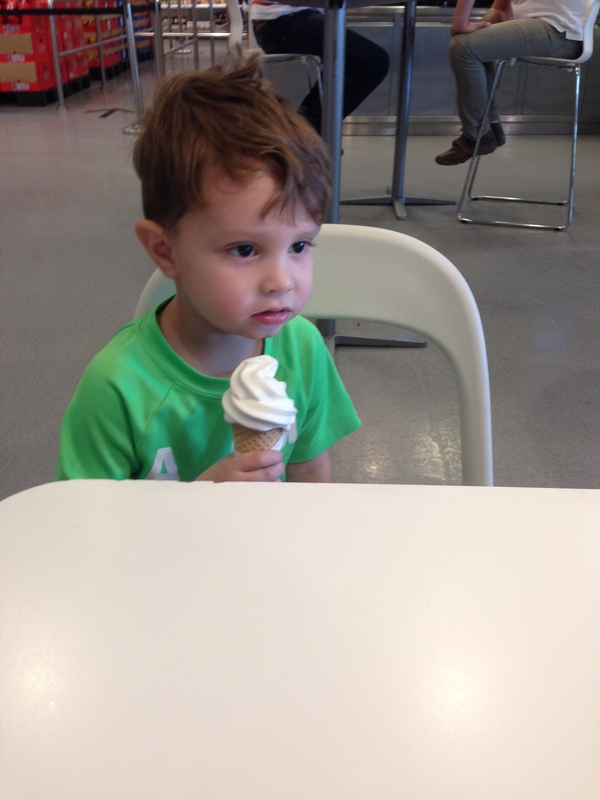 Even an ice cream cone can’t hide his disappointment at being at IKEA…again. I’m still hoping that we get to start living at the apartment early this week. Once we do move, there will be a lapse in updates as we wait for internet to be set up in the apartment. I’ll try to give warning so you know when that’s coming. For now, I anticipate that we’ll be at the hotel at least through Monday overnight. Will keep you all posted. Life here is coming together, slowly but surely! p.s. Our Arizona house sale closed last week! So nice to have that behind us. A million thank-yous to Mom and Dad Galietti for facilitating the last minute/wrap up items that allowed the sale to close on time. Farewell, house on Richwood Avenue! p.p.s. Matteo has started calling me “Jen” and then laughing about it. I am not amused….okay, I’m a little amused.